San Francisco (Obama.net)- In professional sports, one of the worst things any franchise can endure is a championship drought. Major League Baseball has been home to some of the most prolific droughts in sports. From the Boston Red Sox 86 year drought that ended in 2004 in arguably one of the most exciting playoffs MLB has ever seen, to the Chicago Cubs who have not won a World Series in 102 years, and the Cleveland Indians, who last clinched a championship in 1948. One team that is no longer on that list is the San Francisco Giants. Having last won the World Series in 1954 when they were still known as the New York Giants, the surprise championship contenders of 2010 clinched their first World Series title in 56 years on Monday night. Led by one of baseball’s biggest superstar’s Tim Lincecum, the Giants outdueled the Texas Rangers and their pitching ace Cliff Lee for a final score of 3-1 in Game 5. Lincecum and Lee both had stellar performances for most of the game, but then Lee’s solid game was spoiled by Edgar Renteria and his three-run home run. 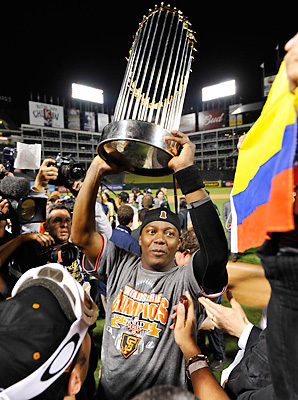 The team was led by what Bochy called “misfits and castoffs.” The 2010 championship roster was full of players who were released by other teams and not exactly fought over by others. Names like Pat Burrell, Cody Ross, Aubrey Huff, Juan Uribe and Edgar Renteria fill the locker room. Renteria was named the series MVP. The pitching staff was headlined by top names such as Lincecum, Wilson, Matt Cain, Jonathan Sanchez, and Madison Bumgarner. While the Giants celebrated in Arlington Monday night, the players in the home dugout held their heads down. After making it to their first World Series appearance ever, the Texas Rangers, led by names like Josh Hamilton, Nelson Cruz, Vladimir Guerrero, Ian Kinsler, and Cliff Lee, go home empty-handed. But for San Francisco, the taste of victory will be savored as long as possible because after 56 years of waiting, the San Francisco Giants are truly giants in the baseball world.